Whether you’re big or small, you won't go wrong with the beautiful Malibu dining chair - a great value. It has a curved back and contoured seat for maximum comfort. The arm chair has a beautifully, continuous arm design. It will transform your dining room into a theatre for entertainment! 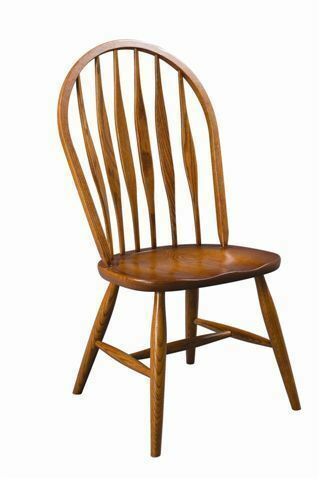 The Clover Windsor Dining Chair features a wide molded seat that accommodates large persons. It also features steam bent spindles that are curved for maximum back support, comfort and beauty. I would like to thank you and the team at JMX. In September 2005, my family moved to a home. I began looking at dining room furniture that I could purchase for our home. We spent many weekends visiting stores within a 25 radius of home in a small village in Hertfordshire. The quality of British and European furniture left me concerned with how long the items would last in a very busy household, who all sit and eat together daily. I came across the JMXCO web site while looking for a lighthouse for my son’s bedroom. As I have always admired Amish style durability and ageless designs, I thought that I could approach your company to find out the possibility of having furniture made in America and shipped to me in England. My first contact with Linse was very hopeful, who confirmed that this could be done. Carolyn spent several months helping me understand what an extension, skirt and apron were. She was so patient with me, when things were not making any sense at all. Often times we would email each other up to three times a day. We can whole heartily recommend JMX to any of our friends and family. We are now looking at purchasing other furniture for our home, I am sure that this new found relationship that I have with your company will continue for many or years to come.